Preheat oven to 350 degrees F. Spray 12 muffin cups with nonstick cooking spray. Mix together oats, and baking powder. Add eggs, milk, and honey, stirring until fully incorporated. Pour in melted coconut oil and stir. Scoop batter evenly into 12 muffin cups. 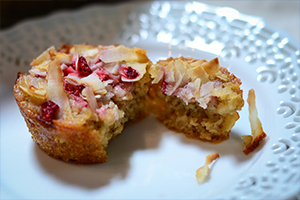 Sprinkle about a teaspoon of chopped strawberries & coconut flakes into the center of each cup. Bake for 20 – 25 minutes, or until the oats are golden brown. Let cool and enjoy! These freeze great in a freezer zip-top bag. 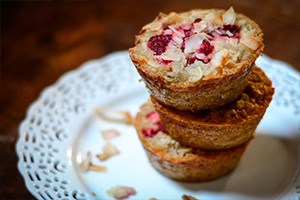 Just remove an individual Oatmeal Muffin, and microwave for 15 seconds or so for a delicious and nutritious breakfast for your little one on the go!